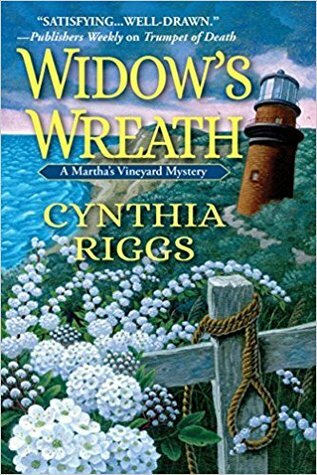 Victoria has assumed the reception will be a modest lemonade-and-gingersnap affair—but when a body is found in her cellar, it may be a happily never after in Widow’s Wreath, the fourteenth engaging installment in Cynthia Riggs’s beloved Martha’s Vineyard mysteries. This series features one of my favorite characters, Victoria Trumbull. And Victoria has no idea what she has let herself get involved in when she agrees to provide her back garden for her distant cousin’s wedding reception. When a body appears in her cellar, people start popping out of the woodwork and plopping themselves down at Victoria’s home. There are numerous people who would love to see the groom dead and buried. First among them, the fiancée’ back home having wedding invitations printed while he is marrying someone else. And none of them have a problem with telling Victoria they plan on killing him. But still, who is the body in the basement? I am not exactly sure what went on with this one. Definitely not a cozy mystery. And what about Elizabeth? She lives with Victoria, we know. She is in the first chapter and then we don’t hear or see her until many chapters later. The house is overrun with strangers and cops, but where is she? This one was quite a bit different from the others in the series. Stiff dialogue, not being sure of who was talking when, I’m just not sure but this one did not resonate with me. We will check the next one however! Aww bummer that this one didn’t work out for you! I guess they can’t all be winners though. Hope your next read is a 5 star read!